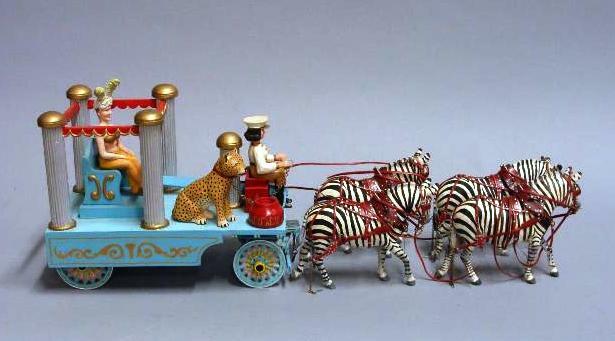 This entry was posted in Art, Museum & Gallery Exhibits and tagged acrobats, Ancient Rome, Bert Backstein, Bob Moore, chariot races, Circus, Cirque du Soleil, clowns, Golden Age of Circuses, Gordon Potter, Hagenbeck Wallace Circus, Potter Backstein Collection, Ringling Bros. And Barnum Bailey Circus. ‘Medieval times’ is pushing it a bit far! The compilation of acts into one formal entertainment, stemming from a base of trick horse-riding, came in the last decades of the 18th Century; the regular use of tents over the 13m diameter rings (a standard size based on the centripetal force required to keep a performer upright as their horse charges around the ring) was uncommon until well into the 19th Century. 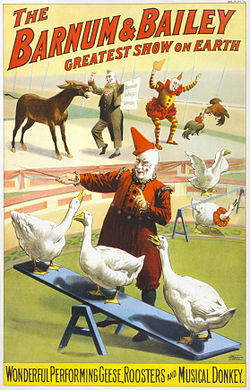 Whilst we’re at it, the first American circus in Philadelphia was established by an Englishman, John Bill Ricketts! Thanks for that Katharine. I think you might be thinking only of North America, though. The Romans were the first to gather different types of ‘entertainment’, in once place, for the enjoyment of very large groups. England started to see traveling entertainers during the Dark Ages (jugglers, minstrels), and they would often set themselves up with tenting. Queen Elizabeth I made the practice illegal. That’s when permanent, covered arenas appeared. Sadler’s Wells was the first, in 1683; in 1769 Philip Astley opened the first ‘circus’ building, The New British School of Amphitheater Riding Ring. In 1779, he had a roof put on it. That’s just England–‘Circus’-type organizations have existed, all over the world, for centuries. Yeah, it’s really hard to pin-point exact definitions in relation to circus! I was thinking of the formalised entertainment that is usually recognised as the ‘birth of modern circus’ by circus historians such as George Speaight. Maybe the article is over-simplified for my taste, and gave me the wrong impression of your research – but it is difficult with such a vast subject when you’ve got a word count to adher to! I wasn’t aware trick riding was used as an artistic entertainment before the Astley era (thinking of the Roman games in more of a sporting vein), so I’ve learnt something too! I imagine that trick-riding began when men started riding horses–back when people didn’t have much else to do (lol). The skill of the Mongolian horsemen, for example, has been famous (and feared) for centuries. And you’re right about the word count–all of these art/museum exhibit blurbs had to fit in a particular space on the inside back page of the magazine. Maybe, when I’m finished loading in my portfolio, I’ll go back and expand on this piece (and others).